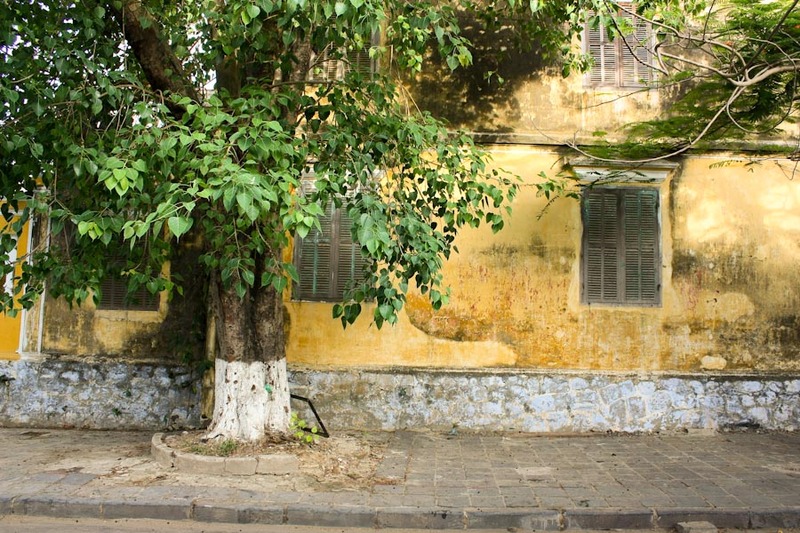 Hoi An is a crumbling beauty. Not so long ago, it was just a forgotten, sleepy village whose main charm was that it hadn’t been bombed into oblivion during the war. Now, it’s on the tourist trail in a big way and is crammed full of restaurants, hotels, and clothing shops. Old Town looks much as did did a hundred years ago, with tiny buildings packed cheek-to-jowl, their walls covered in fading, worn paint. It reminds me, in a sense, of Venice. I’m here in the low season and the tourist presence is strong — I can only imagine what it’s like in the high season. Normally, that would irritate me, but I just can’t bring myself to complain — it’s just so relaxed and lovely. We totally have the same photography sensibility – I’m missing the bike but we’re attracted to the same colour schemes. .-= ayngelina´s last blog ..Leon’s Museum of Legends and Myths =-. Your photo of the blue door is stunning! Thanks, Lisa. To be honest, it’s hard to take a bad photo here — amazing place, visually. Love your photo’s. Looking forward to returning in Feb. It must be awesome to be there in low season. Enjoy! .-= Dave and Deb´s last blog ..Mt McKinley from Denali National Park- Snapshot Sunday =-. Nice blog – you’re a fantastic photographer. A friend and I have been riding from Saigon ever since May, and we’re abou to roll into Hanoi. When you leave Hoi An, I strongly suggest you take the 1A up to Hue. Normally the 1A is a truck-swamped hellroad that we avoided at any cost, but that stretch goes over a huge mountain range jutting out into the ocean and is stunningly beautiful. Be sure to check out the ruined French hill fort at the top too! .-= Mitch´s last blog ..DAY 67- The Country Of No =-. Thanks, Mitch. I’ve been checking out your blog and I am *so* glad I didn’t buy a Minsk. Best of luck on the last leg to Hanoi! You’ll make it! luvvvved Hoi Ann. I begged an artisan to adopt me! Gorgeous photos, Wes. .-= Nomadic Chick´s last blog ..Greyhound Politics =-. .-= Rambling Saffie´s last blog ..The Doosan Bears =-. I hope that dog isn’t going to become someone’s meal. Or am I thinking of a different country? Great photos, as always. This one’s too cute to eat! I loved Hoi An, spent 2 months there, even spent 1 week in the hospital for a fractured forehead. Cool that you’re in Vietnam, one of my favorite countries in the world. .-= SHABL´s last blog ..SHABL Attending a Polish Wedding =-. Nice to see Hoi An through someone elses eyes! Well done, you have captured the spirit of the ancient city! I was in Hoi An Summer 2009 , although the hotel i stayed at offered a pool. It was made up by the staff going thru your bags. And they know when your not in your room cause you have to leave the key when you go out. Usually its to cut the power to your room. But some hotel staff are under paid. So they have jobs to supplement themselves. But your right. Hoi-An is crumbling and no one knows how to fix it. I also took a hop on hop off buss from Tam Ky a ride that takes 1 hour for 25 miles south . Yeah, this kind of theft is a problem in many places. I lock my stuff in a duffel bag if I’m worried about it. They can still cut it open but then you *know* that someone has been in there.